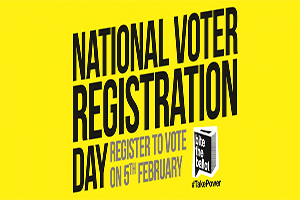 On Wednesday February 5th, Solent Students Union and University of Southampton Students’ Union are teaming up with Bite the Ballot to hold a day of coordinated action, aimed at empowering students through registering to vote. Bite the Ballot (bitetheballot.co.uk) is a party neutral organisation aimed at increasing voter engagement among young people. In the 2010 General Election, only 56% of 18-24 year olds were registered to vote, and just 44% voted. This is compared to 96% of people aged 65+ registered, with 76% of that age group voting. Claire Gilbert, VP Engagement at University Students’ Union, says: “In the last General Election only 44% of people aged 18-24 voted. Solent Students’ Union will be running info workshops and inspired games on the main University concourse, that aim to highlight just how important participating in elections is for representation among young people. University of Southampton Students Union will be running a communications campaign aimed at hitting as many students as possible with a view to maximizing student signups. Solent Students’ Union President, Christina Stone says: “Young people, and especially students, were targeted extremely harshly after the last general election. Cuts of University funding and a 300% hike in fees are just the start. People can register to vote online at www.aboutmyvote.co.uk. Alternatively, come and visit us on Wednesday 5th February, and learn about how you can make yourself, and your opinion, count. « Want to get involved at SUSU but don’t know where to start?